represents business entities of all sizes in a variety of complex commercial litigation issues, providing the sound and reasoned counsel clients seek from an experienced legal professional. When it comes to navigating complex legal matters, it is important to rely on the judgment and expertise that can only be provided by experienced trial attorneys with a proven track record of successful outcomes. By offering the responsiveness, efficiency, flexibility and personal attention expected from a boutique law firm, we are able to give our clients the personal attention that each matter deserves, all with the experience and resources of a large firm. "In 2015, we had a roof installed at our home by a large roofing company in the area. The new roof leaked causing major damage and cost to our home. We continuously tried to work with the roofing company to stand by their product/workmanship to no avail. We hired Jennifer Grieco of Altior Law. We set up a meeting with Jennifer and she immediately put us at ease with her professional knowledge, past experience and support of our situation. She explained the process so that we understood..."
"We were referred to Jennifer after experiencing significant damage to our home due to the work of a hired contractor. Obviously we were very concerned with the losses that we faced and had a lot of anxiety as our previous attempts to remedy the situation went ignored. Jennifer did a great job of gaining our confidence due to her vast experience with situations very similar to ours. She did a great job of laying out the process each step of the way, and she spoke to us in terms anyone..."
"I spent many months searching for an attorney who had the accounting, tax, audit and litigation experience to handle my case and would not be afraid to take on large and generally well respected accounting and legal firms such as the ones involved here. That lead me to Ken Neuman, a C.P.A. attorney with many years of accounting and malpractice litigation experience. I could not give a higher recommendation to anyone than I would give to Ken and his partners for handling this type of claim and litigation." to the Pro Bono Circle of Excellence at the Leadership Level. 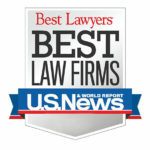 Best Lawyers® “Best Law Firms"
as one of U.S. News – Best Lawyers® “Best Law Firms”. which is published yearly by Super Lawyers Magazine. Managing Partner Ken Neuman and Partner Jennifer Grieco have been named to the Top Lawyers list in dbusiness magazine. Neuman was recognized for Litigation—Commercial, while Grieco was recognized for Professional Malpractice Law.